He was speaking at the inauguration of an event in Jaipur to mark the third anniversary of the Narendra Modi government. 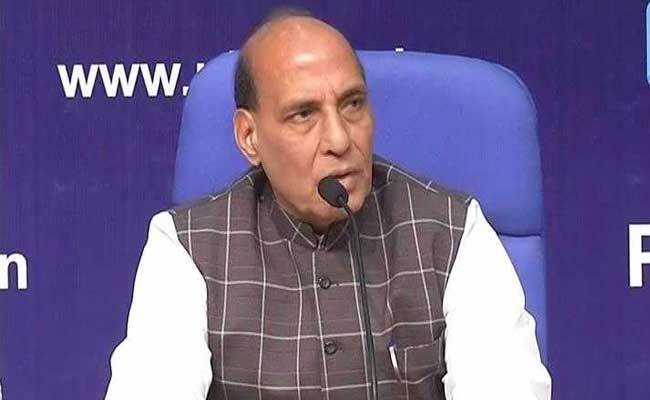 Home Minister Rajnath Singh said borders would be fortified to curb illegal infiltration. Jaipur: Union Home Minister Rajnath Singh said today that the country's borders were "more secured" than before and would be further fortified to stop illegal infiltration. "India's borders are more safe and secured as compared to the past and the government has decided to make the borders highly secured in the years to come so that no citizen of a foreign country can enter into India without the permission of the government of India," Mr Singh said. He said the surgical strike carried out by Indian forces on terrorist launchpads across the Line of Control last year had given a strong message that, if needed, India could hit targets beyond its boundary. "Terrorists from Pakistan infiltrated into India and attacked our jawans and took their lives. The Prime Minister called a meeting after which the Army successfully conducted the surgical strike," he said. In the programme organised at Muhana mandi region and attended by scores of farmers, the home minister said the government had taken several decisions for the development of the country and aims to establish a "new India" for which the cooperation of people, youths in particular, was needed. "The government cannot give jobs to all youths but can develop their skill so that they can start their own work. For this, the government has opened skill development centres and providing them loans at low interest rates," he said. He said that the government plans to provide LPG connections to five crore families by 2019. "Over two crore connections have been given and the rest will be given by 2019," he said. Mr Singh also said that corruption was rampant under the erstwhile UPA government, but there has not been a single allegation of corruption after the Narendra Modi-led NDA dispensation assumed office in 2014.